*“Maybe you don’t need to own all this stuff.” *After a casual conversation with his neighbor on Memorial Day 2008, Joshua Becker realized he needed a change. He was spending far too much time organizing possessions, cleaning up messes, and looking for more to buy. *The More of Less *delivers an empowering plan for living more by owning less. 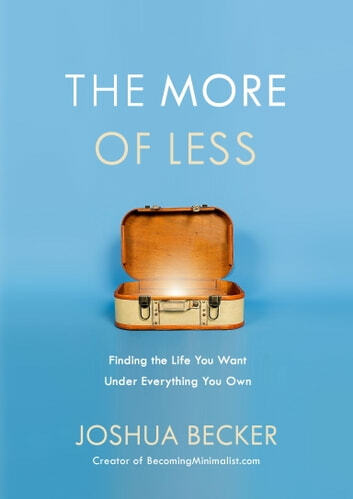 With practical suggestions and encouragement to personalize your own minimalist style, Joshua Becker shows you why *minimizing *possessions is the best way to *maximize *life. I really enjoyed this book. It was an easy read and I found it to offer very practical tips in getting started at removing the clutter from my home. It was more than just getting rid of stuff though - it was about finding out what was best for me - very different from other minimalism books I have read. I'm so glad I bought this book. My anxiety has decreased since starting this journey. Practical and thought provoking book on minimalism. I appreciated the flexibility in the out-working of this book. No cookie-cutter approach here. Minimalism will look a bit different for everybody as it applies in a practical way to each ones life. Great explanations of the 'why's' of minimalism, while not neglecting some great 'how-to's' of its application. Great book to help work through the process! Gotta go minimize! This book was easy to read and very informative!! !